Mudd's Furniture Showrooms Inc. was established in 1951 by Lawrence and Callista Mudd. They built their business on the principle of selling quality furniture at a reasonable price and providing the best customer service they could during and after the sale. Although the store has grown and gone through many changes since then, that one principle has remained the same: we believe if we treat our customers the way we want to be treated, God will continue to bless us, as He has so abundantly blessed us in the past. Lawrence Mudd passed away in 1989. His wife, Callista, and their son, David, still own the business Lawrence worked so hard to build. 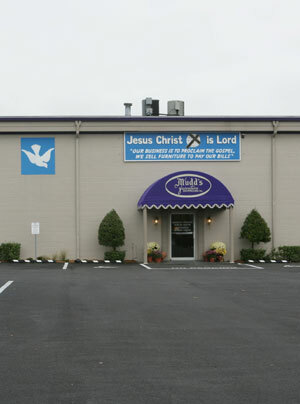 His faith in Jesus Christ, his dedication to the customer, and his enthusiasm for the business is still the heart of Mudd Furniture today. Our 25,000-square-foot showroom offers a wide variety of living room, bedroom and dining room furniture as well as the largest selection of unique accessories and gifts in the area. We offer scheduled delivery to customers within a 50-mile radius of Owensboro.